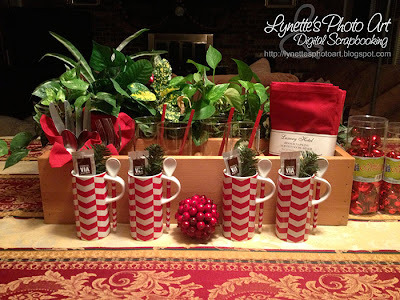 Lynette's Photo Art: CD Holder Upscaled to Divided Tray - Dressed For Christmas! CD Holder Upscaled to Divided Tray - Dressed For Christmas! A little while back I posted a tutorial on how I upscaled an old wooden CD holder into a Pottery Barn Knock off type divided tray server. It turned out so cute, and useful. Well, a couple of days ago my oldest daughter stopped by to show me her treasures. She's a Starbucks store manager and has been eagerly waiting for when she could buy these four unbelievably adorable mugs with matching spoons and peppermint Via to sit in each. Her store only got four of them. She joyously unwrapped each one and set them on the table. A second later she realized they were the same red as my tray display and arranged them in front of it. They're just perfect with the tray and these mugs are too cute! You know where this is going, don't you? 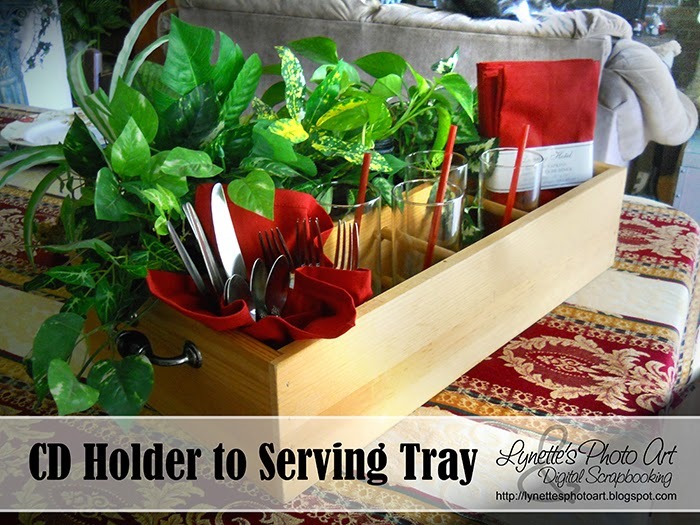 She instantly decided they were so perfect with the tray that they had to stay here! I couldn't talk her into taking them home. I am blessed with the most wonderful daughters! I added a sprig of evergreen to each and voila! A happy note here is that today she was able to replace them, so now she has a set too. :) They really are too sweet, and they are also the red that I'm using as accent color in The Accidental Remodel of our kitchen, so I can display them there too! I have not been compensated for this post, it was just too cute to keep to myself!